Dangwa, the flower center of Metro Manila, is located at Sampaloc Manila. 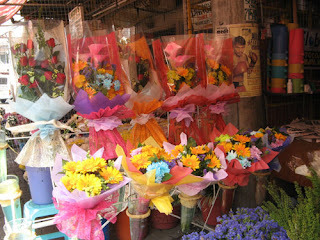 Ready-made flower bouquets can be bought here at prices ranging from P250 - P300 per bouquet. Along Quirino Highway (Novaliches-Ipo Road), ride an FX/jeep to Blumentritt, and get off at Dapitan. Ride a jeep to Quiapo, and get off at A.H. Lacson (Gov. Forbes). Dangwa is just after UST/A.H. Lacson (Gov. Forbes). Ride a bus to Lawton via NLEX and get off at EDSA corner Taft Avenue. Along Quezon Avenue, ride an FX/jeep to Quiapo, and get off at Quiapo. At Quiapo, ride a jeep to Dapitan-UST or Blumentritt-Dimasalang, and get off at Dangwa. Dangwa is just after UST/A.H. Lacson (Gov. Forbes). Ride a bus to Lawton and get off anywhere along Taft Avenue. From Taft, take the jeep to Dapitan-UST or Blumentritt-Dimasalang, and get off at Dangwa. Dangwa is just after UST/A.H. Lacson (Gov. Forbes). Take the MRT to EDSA-Taft station, walk through the connecting bridge, and take the LRT1 to Vito Cruz station. Take the PVP Liner to Taft, and get off along Taft (anywhere between Vito Cruz and Manila City Hall). From Buendia (Sen. Gil Puyat Avenue), take the jeep to Taft, and get off at Buendia-Taft. Take the jeep to Divisoria, and get off anywhere between Vito Cruz and Manila City Hall. Take the jeep to Dapitan-UST or Blumentritt-Dimasalang, and get off at Dangwa. Dangwa is just after UST/A.H. Lacson (Gov. Forbes). Ride the jeep to Quiapo, and get off at Quiapo. The jeep will pass through Legarda, Recto, and Mendiola. From Bacood, Punta, or Sta. Mesa, ride a jeep to Quiapo, and get off at Quiapo. Ride a jeep to Baclaran. Ride a jeep to Taft Avenue and get off anywhere at Taft Avenue. From Philcoa, Cubao, Aurora Boulevard, or Quezon Avenue, ride a jeep to Quiapo, and get off at Quiapo. From Philcoa, ride a jeep to Buendia-Vito Cruz, and get off at Quiapo.